I knew I had to try these Fudgy Black Bean Brownie Bites as soon as I heard about its magical secret ingredient. Always looking to find healthy ways to bake, this one was a no-brainer: a whole 15 oz can of black beans is added to the brownie ingredients, substituting flour and adding a tasteless but texture-rich moisture and essence to your typical brownie. Plus, you cannot beat the health benefits: an antioxidant superstar, beans also contain protein, B vitamins, potassium, and fiber. This cholesterol-free, low-fat legume has been shown to promote digestive health, relieve constipation, and is linked to colon cancer prevention and blood cholesterol reduction. Finally, beans are inexpensive and and very filling, which helps to combat portion control against your typical calorie-dense brownie. And if you don't like the taste, it doesn't matter, because you really can't taste it in these brownies!! I originally set out to make brownies, but they didn't rise enough while baking so instead i switched to 2 x 2 brownie bites. The flavor is extremely fudgy and rich, thanks to a combination of unsweetened cocoa powder, dark chocolate bites and ground coffee. Preparation is also super easy. *The original recipe called for 1/3 cup melted butter, but as I like to minimize saturated fat and cholesterol as much as possible, I opted for half butter and half canola oil. You can choose your own ratio of butter to oil, refer to the chart below for accurate measurement substitutions. Butter an 8-inch baking pan. Place the black beans, eggs, melted butter, cocoa powder, salt, vanilla extract, sugar, and coffee in the bowl of a food processor and blend until smooth. 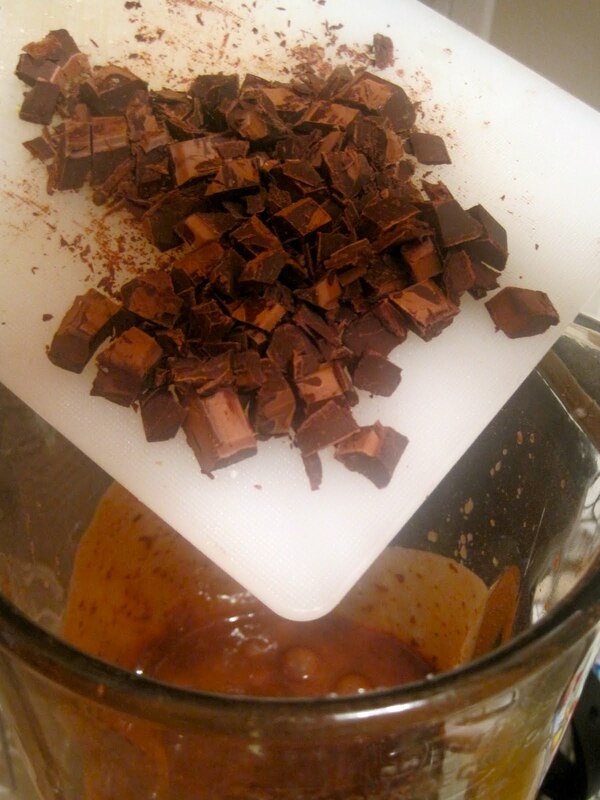 Remove the blade and gently stir in the chocolate chips and walnuts. (Walnuts can be toasted in advance in a dry pan on medium heat for 8 minutes, stirring periodically to make sure they don't burn.) Transfer mixture to the prepared pan. Bake the brownies for 30 to 35 minutes, or until just set in the center. Cool before cutting into squares. The brownies turn out a little sticky, so I recommend refridgerating the pan before cutting into squares. They are also great for freezing. "Baking With Canola Oil: Give Trans Fat the Boot." Culinary Institute of America. Web. 27 Aug. 2011. <http://www.ciaprochef.com/canola/transfatboot.html>. Davis, Jeanie L. "Antioxidant Superstars: Vegetables and Beans." MedicineNet.com. WebMD Weight Loss Clinic - Feature, 22 Apr. 2005. Web. 27 Aug. 2011. <http://www.medicinenet.com/script/main/art.asp?articlekey=56120>. I just made these and they are INCREDIBLE!!! The beans gave the brownies a deliciously fudgy and rich texture, but I couldn't taste them at all. (In fact, I gave one to a friend and asked her to guess the secret ingredient - she failed.) The only coffee I had was French vanilla, which gave them a nice extra vanilla/coffee tang. I cooked them for a little under 30 minutes, so they were nice and soft but not too gooey. Not only are these really healthy, they are gluten-free and kosher for Passover!! I don't think I'll ever make regular brownies again. 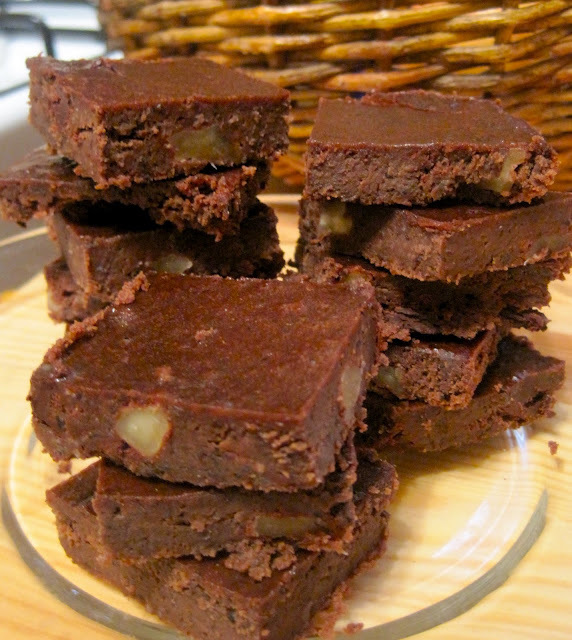 These almost look like fudge....what a great batch of treats.